There&apos;s no question the farmhouse style is one of the most popular home decor styles right now. If you&apos;re looking to add some farmhouse flair to your home, but want something more unique than what you can find in chain retail stores, a new store in Clermont is the perfect place to look. Urban Rustic Farmhouse, located at 10992 U.S. 136 in Clermont off Raceway Road and just inside Hendricks County, opened about eight months ago, and the facility is stocked with a great selection of hand crafted furniture, refinished/repurposed furniture, wall decor, artisan soaps and candles and more. I stopped in the store recently and had the opportunity to talk to the store&apos;s owner, Wes Hollis. Hollis was in the middle of finishing a beautiful kitchen island that I would describe as rustic farmhouse/industrial style. The kitchen island had a beautiful butcher-block top and a place in the back to store stools. Hollis said his business began with building furniture. Before opening Urban Rustic Farmhouse, Hollis started selling his custom furniture online. 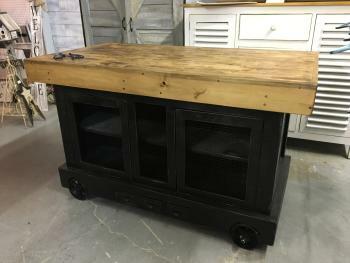 In addition to selling his creations at the Urban Rustic Farmhouse, other artisans rent booth space to sell their farmhouse-style items as well. As I browsed the store, I was excited to see a huge selection of rustic metal letters for sale that Visit Hendricks County has featured in its Holiday Gift Guide. Those letters could be used as decor on their own or could be made into signs to say a word or message. I also found a vintage record player that had been painted in a unique way that I absolutely loved. I could have spent hours browsing the Urban Rustic Farmhouse because there are so many great items for sale. I know I will be going back again, which is important according to Hollis, because the inventory changes so often. 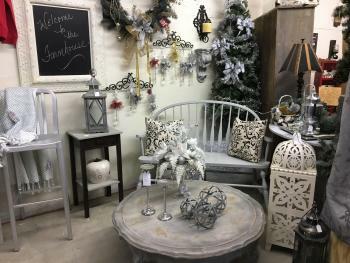 If you&apos;re looking to find a unique item as a last-minute Christmas gift, or if you want to refresh your home decor for the new year, be sure to visit Urban Rustic Farmhouse soon.